A chimpanzee, often shortened to chimp, is one of the two extant ape species in the genus Pan. 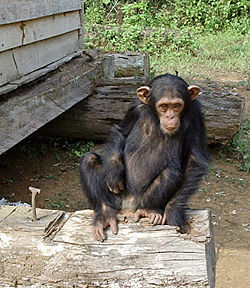 The better known chimpanzee is Pan troglodytes, the common chimpanzee, which lives in West and Central Africa. Its cousin, the bonobo (Pan paniscus) is found in the forests of the Democratic Republic of the Congo and was previously called the pygmy chimpanzee. The Congo River forms a boundary between the habitats of the two species. As apes, chimpanzees are members of the Hominidae family of primates. The Hominids, also referred to as the "great apes," consist of gorillas, chimpanzees (including bonobos), orangutans, and humans. A full grown adult male chimpanzee can weigh from 75 to 155 pounds (35 to 70 kilograms) and stand three to four feet (0.9 to 1.2 meters) tall, while females usually weigh between 57 and 110 pounds (26 to 50 kilograms) and are two to three and a half feet (0.66 to one meter) tall. Chimpanzees rarely live past the age of 40 in the wild, but they are known to live to be 60 years old in captivity. Tarzan star Cheeta was still alive in 2006 at the age of 74. Anatomical differences between common chimpanzees and bonobos are slight. The exposed skin of the face, hands, and feet varies from pink to very dark in both species, but is generally lighter in younger individuals, darkening as maturity is reached. Bonobos have longer arms and tend to walk upright much of the time. There are marked differences between the two chimp species in sexual and social behavior. Common chimpanzees have an omnivorous diet, a troop hunting culture based on beta males led by a relatively weak alpha male, and highly complex social relationships. Bonobos, on the other hand, have a mostly herbivorous diet and an egalitarian, matriarchal, and sexually promiscuous culture. Although Africans have had contact with chimpanzees for millennia, the first recorded (Western) contact of humans with chimps was made by Europeans scouting Angola during the seventeenth century. The diary of Portuguese explorer Duarte Pacheco Pereira (1506), preserved in the Portuguese National Archive (Torre do Tombo), is probably the first European document to acknowledge that chimpanzees built their own rudimentary tools. The first use of the name "chimpanzee," however, did not occur until 1738. The name is derived from an Angolan Bantu term "Tshiluba kivili-chimpenze," which is the local name for the animal and translates loosely as "mockman" or possibly just "ape." The colloquialism chimp was most likely coined some time in the late 1870s. Scientists related the syllable “pan” in "chimpanzee" to Pan, a ancient Greek nature deity, and applied it as the genus name of the animal. According to Euro-Arabic myths and legends, chimps as well as other apes existed in ancient times, and fragmented accounts of these stories were relayed by European adventurers. When chimpanzees first began arriving on the European continent, scientists there noted the inaccuracy of these ancient descriptions, which often falsely purported that chimpanzees had horns and hooves. The first of these early transcontinental chimpanzees came from Angola and were presented as a gift to the Prince of Orange in 1640. In 1698, Edward Tyson, an English anatomist dissected a young chimpanzee that had come from Angola and had died soon after arrival. He published his findings in 1699 in the book Organ-Outang, Sive Homo sylvestris; or, The Anatomy of a Pigmie. This was the first scientific publication of the complete anatomy of a chimpanzee (Wood 2006; Montagu 1943). Scientists who initially examined chimpanzees often described them as "pygmies," and noted the animals' distinct similarities to humans. Darwin's theory of evolution (first published in 1859) spurred scientific interest in chimpanzees, as the anatomical similarity of apes and humans was offered as evidence for the theory of common descent. This led eventually to numerous studies of the animals in the wild and in captivity. The observers of chimpanzees at the time were mainly interested in behavior as it related to that of humans. Much of their attention focused on whether or not the animals had traits that could be considered "good," and the intelligence of chimpanzees was often significantly exaggerated. By the end of the nineteenth century, chimpanzees remained very much a mystery to humans, with very little factual scientific information available. The twentieth century saw a new age of scientific research into chimpanzee behavior. The most progressive earlier studies on chimpanzees were spearheaded primarily by renowned psychologists Wolfgang Köhler and Robert Yerkes. The men and their colleagues established laboratory studies of chimpanzees that focused specifically on learning about the intellectual abilities of chimpanzees, particularly their capacity for problem-solving. These investigations typically involved basic, practical tests on laboratory chimpanzees, which required a fairly high intellectual capacity, such as how to solve the problem of obtaining an out-of-reach banana. Notably, Yerkes also made extensive observations of chimpanzees in the wild, which added tremendously to the scientific understanding of chimpanzees and their behavior. Yerkes studied chimpanzees until World War II. Köhler published his famous The Mentality of Apes in 1925, which concluded that "chimpanzees manifest intelligent behaviour of the general kind familiar in human beings…a type of behaviour which counts as specifically human" (Kohler 1925). Prior to 1960, almost nothing was known about chimpanzee behavior in their natural habitat. In July of that year, Jane Goodall set out to Tanzania's Gombe forest to live among the chimpanzees. Her discovery that chimpanzees make and use tools was groundbreaking, as scientists had previously believed that humans were the only species to do so (Goodall 1986). The genus Pan is generally considered to be part of the subfamily Homininae and tribe Hominini to which humans also belong. Biologists believe that the two species of chimpanzees are the closest living evolutionary relatives to humans. It is thought that humans shared a common ancestor with chimpanzees as recently as five to seven million years ago, and that they have about 98 to 99.4 percent of their DNA in common (Wildman et al. 2003, Wood 2006). Indeed, the anatomical and biochemical similarity between chimpanzees and humans is so striking that some scientists have proposed that the two chimpanzee species, troglodytes and paniscus, belong with sapiens in the genus Homo, rather than in Pan. One argument for this suggested reclassification is that other species have been reclassified to belong to the same genus on the basis of less genetic similarity than that between humans and chimpanzees. For example, comparisons between chimpanzees and humans in terms of protein sequences, allele differences, and DNA heteroduplex melting points show more than 98 percent identity (King and Wilson 1975; Wood 2006). Likewise, chromosomal banding patterns reveal a high correspondence between chimp and human chromosomes (Yunis and Prakash 1982). Ebersberger et al. (2002) found a difference of only 1.24 percent when he aligned 1.9 million nucleotides of chimpanzee DNA and compared them with the corresponding human sequences in the human genome (Wood 2006). Using a 4.97 million nucleotide portion of DNA from human chromosome 7 and comparing to chimpanzee orthologies yielded only 1.13 percent mismatches (Liu et al. 2003). A comparison of a rough draft of the chimpanzee genome—involving 361,782 contiguous fragments with a medium length of 15,700 nucleotides, covering about 94 percent of the chimpanzee genome—with the human genome, for those sequences that could be aligned, averaged 1.23 percent nucleotide mismatches (The Chimpanzee Sequencing and Analysis Consortium 2005). This same study suggested that the fixed differences between the two genomes, based on the frequency of single nucleotide polymorphisms, may be as low 1.06 percent, with the remaining differences being variations within the chimpanzee or the human. Comparison of chimpanzee exons and human sequences yielded only 0.6 to 0.87 percent differences (Wildman et al. 2003; Nielsen et al. 2005). Hacia's (2001) review of genetic studies indicated single nucleotide differences were between 1.24 and 1.6 percent. Only a small fraction of the chimpanzee genome consists of sequences not found at the corresponding location in humans. It further appears that human chromosome 2 corresponds to two separate chromosomes in chimpanzees (Wood 2006). Even in terms of some pseudogenes, involving nonsense codons or deletions, many share the same substitutions or deletions in both humans and chimpanzees, as evidenced by the studies of Gilad et al. (2003) on olfactory receptor genes. Of course, the differences between chimpanzees and humans are likewise remarkable. Physiologically, chimpanzees rarely have heart attacks, are resistant to malaria caused by Plasmodium falciparum, and do not go through menopause (Wood 2006). Many cancers common to humans are not found in chimpanzees, and differences exist in terms of the genes for smell and also those that regulate the metabolism of amino acids. Chimpanzees exhibit sexual dimorphism—adult males are nearly 50 percent larger than females, while in humans the males and females are nearly the same size. The behavioral differences are far more significant. In terms of sexual behavior, chimpanzee males compete for status among themselves, and the dominant males mate promiscuously with mature females; while female bands handle child-rearing. Humans, on the other hand, form monogamous pair bonds and raise their young in families where both parents protect and educate the youngsters. Unlike chimp young, which become independent of their mothers within the first year of life, human young require many years to reach maturity, during which the parents transmit language, culture and skills that make up the greater part of human personhood. Chimp behavior includes infanticide by males against young of rival males, and the maiming or killing of former alpha males after they have been supplanted by a new leader. Human males, on the other hand, typically protect the children of other families of their tribe, and former male leaders are respected as honored elders. Respect for elderly males, codified in human morality as filial piety, is another means by which humans propagate and transmit culture. As a result of social learning in family groups and filial respect for elders, humans have come to develop complex languages, use symbols in communication, have created complex technologies, practice and transmit religious belief, pursue science, and create art and literature. Indeed, if one were to overlook the anatomical similarity, the gap between chimpanzees and humans in terms of culture, mental capacity, and various spiritual, emotional, and technological aspects is so large as to dwarf differences between chimpanzees and other animals. In this sense, philosophers have recognized humans as distinct from animals generally, including chimpanzees. While many human fossils have been found, chimpanzee fossils were not described until 2005. Existing chimpanzee populations in West and Central Africa do not overlap with the major human fossil sites in East Africa. However, chimpanzee fossils have now been reported from Kenya. These findings indicate that both humans and members of the Pan clade were present in the East African Rift Valley during the Middle Pleistocene (McBrearty 2005). Clark, A. G., et al. 2003. Inferring nonneutral evolution from human-chimp-mouse orthologous gene trios. Science 302(5652): 1960–1963. Ebersberger, I., D. Metzler, C. Schwarz, and S. Paabo. 2002. Genomewide comparison of DNA sequences between humans and chimpanzees. American Journal of Human Genetics 70:1490–1497. Gilad, Y., O. Man, S. Paabo, and D. Lancet. 2003. Human specific loss of olfactory receptor genes. Proceedings of the National Academy of Science USA 100(6):3324–3327. Goodall, J. 1986. The Chimpanzees of Gombe: Patterns of Behavior. Cambridge, MA: Belknap Press. ISBN 0674116496. Groves, C., D. E. Wilson, and D. M. Reeder. 2005. Mammal Species of the World, 3rd ed. Baltimore, MD: Johns Hopkins University Press. International Chimpanzee Chromosome 22 Consortium. 2004. DNA sequence and comparative analysis of chimpanzee chromosome 22. Nature 429:382–388. Kohler, W. 1925. The Mentality of Apes. 2nd ed. London: Routledge & Kegan Paul. Liu, G., NISC Comparative Sequencing Program, S. Zhao, J. A. Bailey, S. C. Sahinalp, C. Alkan, E. Tuzun, E. D. Green, and E. E. Eichler. 2003. Analysis of primate genomic variation reveals a repeat-driven expansion of the human genome. Genome Research 13:358–368. McBrearty, S., and N. G. Jablonski. 2005. First fossil chimpanzee. Nature 437:105–108. Nielsen, R., C. Bustamante, A. G. Clark, S. Glanowski, T. B. Sackton, M. J. Hubisz, A. Fiedel-Alon, D. M. Tanenbaum, D. Civello, T. J. White, J. J. Sninsky, M. D. Adams, and M. Cargill. 2005. A scan for positively selected genes in the genomes of humans and chimpanzees. PLoS Biology 3(6):e170. Wildman, D. E., M. Uddin, G. Liu, L. I. Grossman, and M. Goodman. 2003. Implications of natural selection in shaping 99.4% nonsynonymous DNA identity between humans and chimpanzees: Enlarging genus Homo. Proceedings of the National Academy of Sciences 100:7181–7188. Wood, T. C. 2006. The chimpanzee genome and the problem of biological similarity. Occassional Papers of the BSG 7:1–18. Yunis, J. J., and O. Prakash. 1982. The origin of man: A chromosomal pictorial legacy. Science 215:1525–1530. This page was last modified on 29 August 2008, at 13:32.